In addition to the credits that we listed in our recent introduction to West Coast girl Lindsey Todd, the model also recently appeared in a television commercial for Cricut Cake, a product that aids in the decoration of baked goods. Said commercial deserves more than a passing mention here, because Lindsey's part in it was truly splendid. 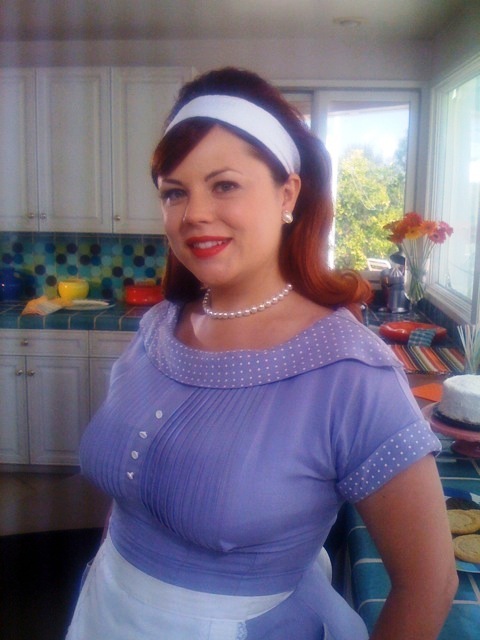 She played a 1950s homemaker, complete with a retro-style dress, pearls, and hair scarf. Ladies and gentlemen, seldom if ever has any plus-size model been presented in a more immediately attractive manner than this. It is as if the commercial's producers reached into the human heart and found there the deepest dream of domestic bliss--the life of happiness and relaxation that every real woman would like to lead, and the ideal vision of love which every man would like to come home to. 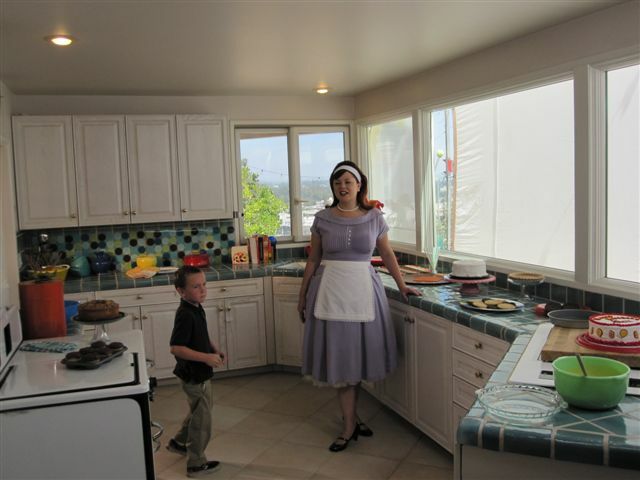 In this photograph of the model's final look for the commercial, notice how Lindsey's convincingly retro dress features pleats at the bust that allow the garment to display her bountiful voluptuousness. Her facial features appear soft and pretty. The image has a misty, soft-focus glow to it, as if it were a memory, or a dream--a dream of a better world than the modern dystopia that we all inhabit. Actually, the image didn't even require a diffusion filter to achieve its sense of dreamlike desirability. The 1950s were the last decade in history in which women were still encouraged to be feminine; the last decade when the fuller figure was still the ideal of beauty. It was a better, nobler age; a time of greater social cohesion and harmony; a time before cultural Marxism and all of its offshoots agitated gender hostility, class warfare, and other forums of societal discontent. It was the last decade in which the natural order of things still held sway. These beautiful images compellingly evoke the idyllic appeal of those times. Just think of those days the kitchen was filled with the aromas of delicious, gorgeous baked goods that your mom or grandma used to make. Remember the time spent with Mom or Grandma decorating beautiful pies, cookies, and cakes? How interesting that to arouse such irresistible feelings of hearth and home, Cricut Cake cast a seductive plus-size model. (Consider the narrator's use of the words "gorgeous" and "beautiful," which are not baking terms at all, but which subconsciously associate the product with Lindsey's sumptuous personal attractions.) The producers clearly recognized that a skinnier model would merely evoke the harsh, modern world, and would be out of place in a depiction of a more beautiful bygone era. But with her soft appearance and fuller figure, Lindsey fits right into this vintage context. Our own favourite still is the following, which shows the model in a graceful, feminine pose, and emphasizes her hips--the alluring fullness of which is evident. Every male viewer seeing this image will find that it resonates in his heart, portraying exactly the kind of womanly form that one would wish to come home to, and embrace, after a long day's labour. 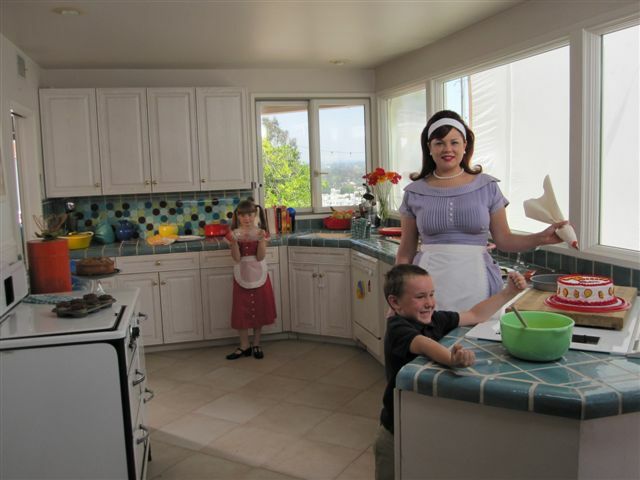 In this picture, Lindsey's character is delighted to see that her husband has at last returned from work, meaning that the family can now spend quality time together. While the couple's son is being a bit rambunctious, he isn't behaving in a malicious or destructive way. The daughter, on the other hand, dressed like a little lady, seems especially happy to see her father. 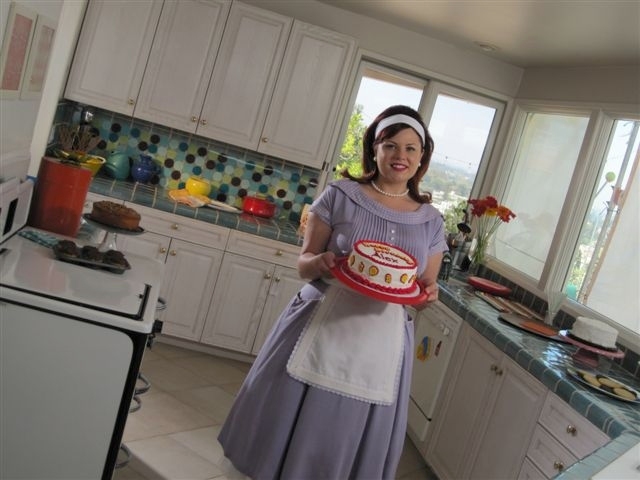 She has proudly assisted in preparing the baked goods, and with her little apron, one senses the continuity of the family--that one day she will grow up to be a loving wife, just like her pretty mother. Lindsey herself appears prim and proper, but young and vivacious as well, and the fact that her dress acknowledges her voluptuousness intimates that this is not a cold or sterile relationship (which is how modern propaganda tries to falsely present the '50s), but still a love affair that is every bit as passionate as the day that the couple wed. These images effectively sweep the viewer into their narrative. One puts oneself in the mindset of the husband coming home to such a beautiful sight, delighting in the fact that not only does his stunning bride enjoy making "baked goods . . . pies, cookies, and cakes," as the commercial states, but that she clearly enjoys eating them as well, given her luscious curves. These images epitomize the concept of "wholesome sexiness," which is the most alluring kind. The fact that Lindsey's plus-size figure appears completely normal and mainstream in this context reminds one that prior to the cultural upheavals of the 1960s, all men were "aficionados of plus-size beauty." All men recognized the curvier female figure as being more desirable than the underweight frame. Indeed, most men still do. What has changed is that this reality is never acknowledged by the modern media (not to mention that models with Lindsey's physique are effectively banished from film and television). In the 1950s, however, the robust screen goddesses of the day, such as Kim Novak, were much closer in size and proportion to Lindsey than to modern, emaciated Hollywood waifs. Just as the plus-size female figure is effectively banned by the modern media, so are truthfully positive portrayals of the womanhood of the 1950s, such as this. And no wonder. 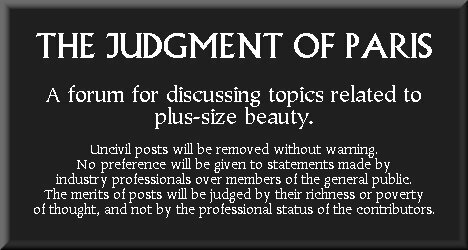 Plus-size models recall a time of greater gender harmony, of veneration for the traditional family, and of respect for natural relations between men and women. The beauty of such goddesses reminds us how much the world has lost as modern ideologies have hijacked our culture. They awaken our desire to recover those timeless principles, to bring back what has been lost. Traditional values were traditions for good reason. They reflected the natural harmony of humanity. We have lost so much beauty and so much culture as we have allowed the modern, alien ideologies of resentment and ugliness to take over our society. But we can still win back everything that Lindsey's commercial represents. All it would take is the will and the fortitude to make it happen. Last edited by HSG : 19th November 2010 at 02:27. I have often heard the 1950s gender roles misrepresented as rigid prisons, but I wonder if our own modern roles are not the crippling, suffocating ones. Once a woman has a baby, she is expected to be back at work six weeks after the birth. In the present day, when people have to read books to learn how to relax and care for themselves, every ounce of energy, every moment is devoted to chasing the almighty dollar, to some notion of achievement and accomplishment, that too often has little or nothing to do with the true desires of one's heart. 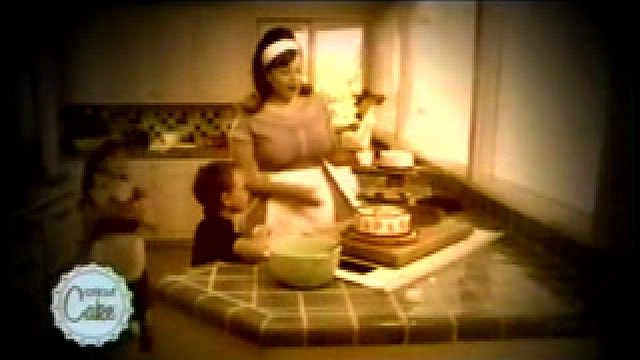 This advertisement is a window into a world of happy women, happy children, who have the leisure to bake, dress up, and play.